Huang, Z. M (2017, September). Making Meanings of Intercultural Experience through an Introspective Space of Creative-Visual-Arts. Paper to-be-presented at 1st International Conference on Intercultural Dialogue through the Arts: Community Development, Education and Policy, Fukuoka and Saga, Japan, 21-24th September, 2017. Huang, Z.M (2017, September). Who am I? Researching the meanings of intercultural experience through creative-visual-arts. Paper to-be-presented as a part of the colloquium ”Creative Inquiry in Applied Linguistics: Researching language and communication through visual and performing arts” at the 50th BAAL conference “Diversity in Applied Linguistics: Opportunities, Challenges, Questions”, hosted by the University of Leeds, 31st August – 2nd September, 2017. Huang, Z. M (2017, June). An imaginative space of knowing: Using creative-visual-arts to understand mindfulness in intercultural communication. Paper presented at the 17th IALIC Conference “Interrogating the ‘Third Space’: Negotiating meaning and performing ‘culture'”, Edinburgh, UK. 19-20th June, 2017. Palacios, N (2017, June). Mexican EFL teachers sojourning in the UK as FLAs of Spanish. Paper presented at the 17th IALIC Conference “Interrogating the ‘Third Space’: Negotiating meaning and performing culture. Edinburgh, UK. 19-20th June, 2017. Fay, R., White, R. & Huang, Z.M. (2017, June). Epistemic injustice and an intercultural ethic of knowledge-work: Perspectives from Global Mental Health. Paper presented the 17th IALIC Conference “Interrogating the ‘Third Space’: Negotiating meaning and performing ‘culture'”, Edinburgh, UK. 19-20th June, 2017. Pérez Gracia, E. (2017, June). Promoting intercultrual awareness in bilingual educaction contexts. Paper presented at the Congreso Internacional de Investigación en Psicología y Educación para el Desarrollo: Interculturalidad, Inclusión y Convivencia, hosted by the University of Córdoba, June, 1st, 2017. Arkhipenka, V., (2017, March). Paradigmatic-type and narrative-type narrative inquiry: Two examples and many questions (with Svetlana Lupasco), Look Both Ways: Narrative and Metaphor in Education, University of Amsterdam, March 2017, Amsterdam, the Netherlands. Palacios, N. (2016, November). Narratives of a professional sojourner: mediating between languages and cultures. Paper presented the 16th IALIC Conference, “Bridging across languages and cultures in everyday life: new roles for changing scenarios”, hosted by the Autonomous University of Barcelona, Barcelona, Spain, November 25th-27th, 2016. Pérez Gracia, E. (2016, November). Primary Education intercultural curricular objectives of CLIL revisited. Paper presented at the II International Conference in Bilingual Education, hosted by the University of Córdoba, November 15th-18th, 2016. Candarli, D. and Palacios, N. (2016, September). Internationalisation in UK higher education: Experiences of international PhD students. Paper presented at the BAAL/Routledge Applied Linguistics Workshop 2016, “Expectations of and on international students in UK HE: investigating mismatching language ontologies and destabilising encounters”, hosted by Manchester Metropolitan University, UK, September 16th, 2016. Attia, M. (2016, September). Understanding Reflexivity in Light of Dewey’s ‘Trying’ and ‘Undergoing’. Paper presented at the Dewey 2016 conference, hosted by Cambridge University, UK, September 28th-October 01st, 2016. Andrews, J., Pöyhönen, S., Fay, R. and Tarnanen, M. [on behalf of colleagues from the Researching Multilingully Hub of the Researching Multilingually at the Borders of Language, the Body, Law, and the State project](2016, September). Researching Multilingually – exploring emergent linguistic practices in migrant contexts. Paper presented at the 2nd International Conference on the Sociolinguistics of Immigration (Slimig2016), Rapallo (Genova) Italy, September 22nd-23rd, 2016. Al-Masri, N., Frimberger, K., Attia, M., Imperiale, G., Fassetta, G. (2016, July). ‘Hope is our bread and butter’: towards a human ecological language pedagogy in the context of siege. Paper presented at the 2nd BIBAC (Building Interdisciplinary Bridges Across Cultures) International Conference, hosted by Cambridge University, UK, July 30th-August 01st, 2016. Huang, Z.M. (2016, July). An interdisciplinary exploration of intercultural sense: Engaging with Visual-Creative-Arts in, as and for research. Paper presented at the 2nd BIBAC (Building Interdisciplinary Bridges Across Cultures) International Conference, hosted by Cambridge University, UK, July 30th-August 01st, 2016. Huang, Z.M. (2016, July). Making sense of intercultural experience: Alex’s ‘mindfulness-bubble’. Poster presented at the 2nd BIBAC (Building Interdisciplinary Bridges Across Cultures) International Conference, hosted by Cambridge University, UK, July 30th-August 01st, 2016. Dawson, S. (2016, June). “Now I understand my puzzle more better than ever”: understanding ‘understanding’ in learner practitioner research. Paper presented at the Warwick PhD conference, June 28th-30th, 2016. Halldorsdottir, T. (2016, May). Warring wor(l)ds: stories as soft weapons and resources of hope. Paper presented at The Twelfth International Congress of Qualitative Inquiry, hosted by the University of Illinois, USA, May 18th-21st, 2016. Fay, R., Andrews, J., Frimberger, K. and Tordzro, G. (2016, May). Creative interthinking: interthinking creatively. Paper presented at The Twelfth International Congress of Qualitative Inquiry, hosted by the University of Illinois, USA, May 18th-21st, 2016. Huang, Z.M. (2016, May). Through the eye of visual-creative-arts: exploring intercultural personhood. Paper presented at The Twelfth International Congress of Qualitative Inquiry, hosted by the University of Illinois, USA, May 18th-21st, 2016. Arkhipenka, V., Fitriyah, S.M. and Sahar, R. (2016, May). Narrative researcher praxis: three reflections on developing doctoral practice. Symposium presented as LANTERN Lunch-time Talk No 6, at the Manchester Institute of Education, May 13th, 2016. Howes, A., Goldrick, S., Arkhipenka, V., Palacios, N., Fitriyah, S.M. and Dawson, S. (2016, April). Exploring participants’ changing perspectives through the life of an inter-school, collaborative, research and development project. Symposium presented as LANTERN Lunch-time Talk No 5, at the Manchester Institute of Education, April 29th, 2016. Sahar, R. (2016, April). Cultures of doctoral supervision: understanding the narrativised experiences of doctoral students at a Malaysian university. Paper presented at the 19th CultNet, hosted by Durham University, April 21st-23rd, 2016. Perez Gracia, E., Gomez Parra, E. and Serrano Rodriguez, R. (2016, April). Key intercultural competences for CLIL teachers. Paper presented at the 19th CultNet, hosted by Durham University, April 21st-23rd, 2016. Espejo, R., Golubeva, I. and Gomez Parra, E. (2016, April). Redefining understanding of (intercultural) citizenship by university students. Paper presented at the 19th CultNet, hosted by Durham University, April 21st-23rd, 2016. Arkhipenka, V. (2016, April). A narrative exploration of MA TESOL participants’ professional development. Paper presented at TESOL Convention, Baltimore, USA, April 5th-8th, 2016. Davcheva, L. and Fay, R. (2016, March). “They thought they heard somebody who had risen from their grave”: stories of multilingual, collaborative, narrative research into Ladino and intercultural identity. Paper presented as LANTERN Lunch-time Talk No. 4 at the Manchester Institute of Education, March 4th, 2016. Huang, Z.M. and Pickard-Smith, K. (2016 February). Using visual-creative-arts to explore intercultural personhood and maths identities. Symposium presented as LANTERN Lunch-time Talk No. 3 at the Manchester Institute of Education, February 26th, 2016. Fay, R. [on behalf of the AHRC Project Team] (2016, February). Living interculturally in a languaged world. Invited Public Lecture presented [as part of the School of Politics, Philosophy, Language and Communication Studies series issues relating to languages, intercultural communication and citizenship education], University of East Anglia, UK, February 25th, 2016. Zhou, X., Penman, C. and Ratz, S. (2015, November). A four-dimensional exploration of university students’ intercultural competence development against the backdrop of internationalising Higher Education. Paper presented at The 15th IALIC Conference on “Intercultural Communication in Social Practice”, hosted by Peking University, China, November 27th – 29th, 2015. Huang, Z. (2015, November). Through the Eye of Visual/Creative-arts: Understanding Mature Students’ Intercultural Experiences at an Internationalised UK University. 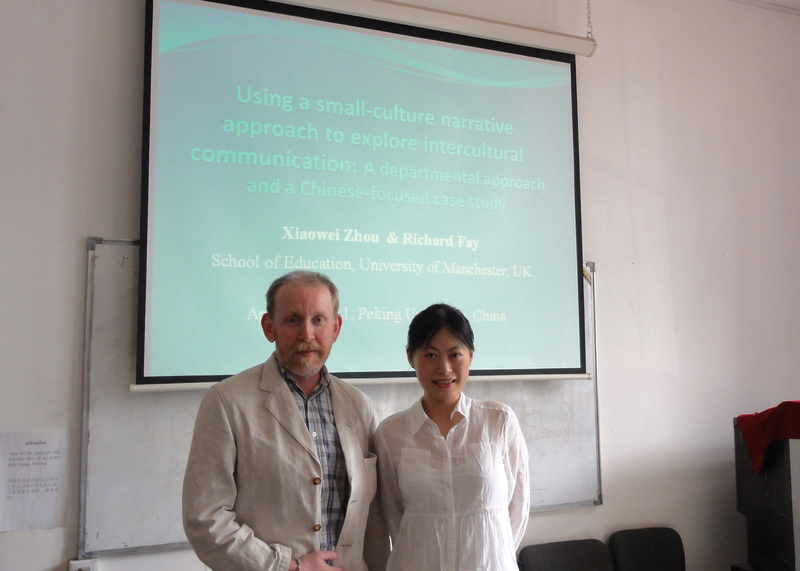 Paper presented at The 15th IALIC Conference on “Intercultural Communication in Social Practice”, hosted by Peking University, China, November 27th – 29th, 2015. Harvey, L. (2015, October). ‘I am Italian in the world’: A mobile student’s story of language learning and ideological becoming. Invited paper, Department of English Language and Linguistics, University of Essex, October 29th, 2015. Harvey, L. (2015, October). Making the mechanics visible: Adapting language education research for performance. Paper presented at Language Research, Performance and the Creative Arts, University of Leeds, October 16th, 2015. Huang, Z. (2015, October). Through the Eye of Visual-Creative-Arts (VCAs): Understanding Mature Students’ Intercultural Experiences. Paper presented at the Language Research, Performance and the Creative Arts scoping event hosted by the University of Leeds, October 16th , 2015. Harvey, L. (2015, October). ‘Making the mechanics visible’: adapting language research for performance. Paper presented at the Language Research, Performance, and the Creative Arts scoping event hosted by the University of Leeds, October 16th, 2015. Harvey, L. and Lewis, R. (2015, September). The Other and the other in intercultural engagement: From authoritative discourse to dialogic possibilities for belonging. Paper presented at 3rd ESTIDIA Conference, Ovidius University, Constanta, Romania, September 25th-26th, 2015. Candarli, D. (2015, September). The development of discontinuous sequences in non-native novice academic writing: A longitudinal study. Paper presented at the 48th Annual Meeting of the British Association for Applied Linguistics (BAAL), Aston University, September 3rd – 5th, 2015. Harvey, L. and Bradley, J. (2015, September). Researching performance and performing research: Telling stories responsibly. Paper presented at the 48th Annual Meeting of the British Association for Applied Linguistics (BAAL), Aston University, September 3rd – 5th, 2015. Candarli, D. (2015, July). A longitudinal investigation of lexical bundles in a learner corpus. Paper presented at the Eighth International Corpus Linguistics conference (CL2015), hosted by Lancaster University, UK, 21st – 24th July, 2015. Fitriyah, S.M. (2015, July). The Introduction of EMI and its Reversal: Insights from Multilingual Indonesia. 11th Annual Conference of the BAAL Language Learning and Teaching SIG. Edinburgh, UK, 2nd – 3rd July, 2015. Tantiniranat, S. (2015, July). “The goal is to teach English, not London is the city with diverse culture. No.”: Some implications for ELF teacher education: an ASEAN perspective. Paper presented at the 12th ELIA Conference hosted by the University of Seville, Spain, 1st – 3rd July, 2015. Tantiniranat, S. (2015, June). The potential role of English language education in developing interculturally competent graduates: an ASEAN perspective. Round Table paper presented at the Education and Development Cooperation Conference hosted by the University of Cordoba, Spain, 3rd – 6th June, 2015. Fitriyah, S.M. (2015, June). The Threat to Linguistic Diversity from National and Global Languages? The Case of Indonesia. Round Table paper presented at the Education and Development Cooperation Conference hosted by the University of Cordoba, Spain, 3rd – 6th June, 2015. Tantiniranat, S. and Fay, R. (2015, May). ASEAN policy documents as an articulation of discourses of intercultural communication and English as a lingua franca. Paper presented at the BAAL IC SIG Annual Meeting, Sheffield, 14th – 15th May, 2015. Harvey, L. (2015, May). Language and the transnational student experience: Developing a research agenda. Paper presented at Rethinking Internationalisation in Higher Education: Methodological and Conceptual Challenges, Newcastle University, May 13th-15th, 2015. Arkhipenka, V. (2015, April). My journey as a researcher: How I crossed the thin line from hating writing to actually loving it. 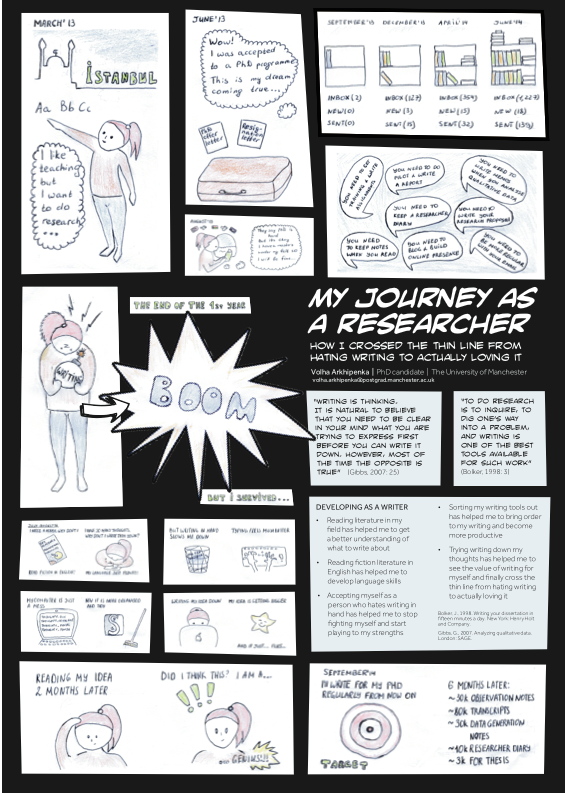 Poster presented at Research SIG pre-conference event, IATEFL, Manchester, 10th April, 2015. Arkhipenka, V. (2015, April). Researching professional development with the use of narrative inquiry. Paper presented at IATEFL (as part of the Research SIG day), Manchester, UK, 12th April 2015. Dawson, S. (2015, April). Exploring the compatibility of Complex Systems Thinking and Exploratory Practice. Paper presented at the Manchester Roundtable on Complex Systems Theory and ELT, Manchester, UK, 15th April, 2015. Dawson, S. (2015, April). EAP learners developing as practitioners of learning. Paper presented at IATEFL (as part of the Learner Autonomy SIG day), Manchester, 11th April, 2015. Dawson, S. (2015, April). 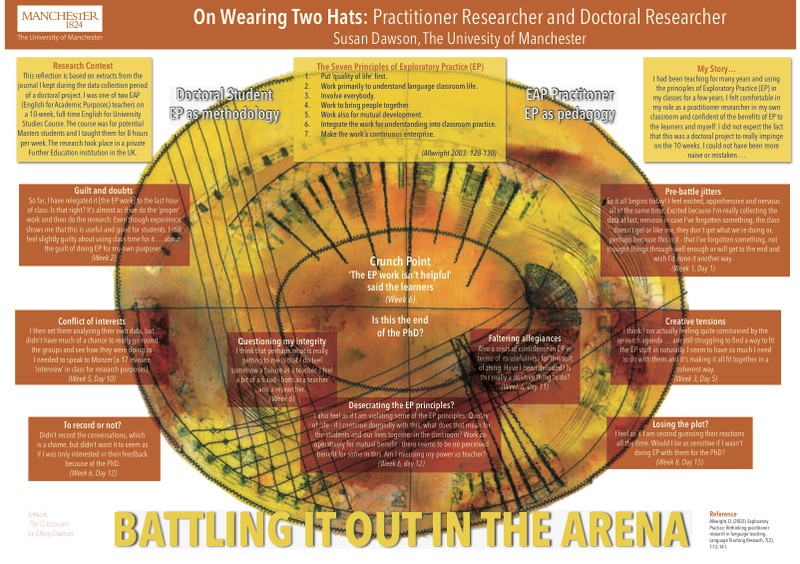 On wearing two hats: Doctoral Researcher and Practitioner Researcher. Poster presented at Research SIG pre-conference event, IATEFL, Manchester, UK, 10th April, 2015. Fay, R. and Dawson, S. (2015, April). Cultures of practitioner research: extending Exploratory Practice from language education to researching multilingually collaboration. Paper presented at CultNet, Durham, UK, 17th – 19th April, 2015. Huang, Z. (2015, April) – Mindfulness in Intercultural Communication: Understanding Postgraduates’ accounts of their intercultural experiences at an Internationalised UK University. Paper presented at CultNet meeting, Durham University, April 25th–27th 2014. Kostoulas, A. (2015, April). Resisting Change: Using Complexity Thinking to Understand the Resilience of Traditional Pedagogy. Paper presented at the Manchester Roundtable on Complex Systems Theory and ELT, Manchester, UK, April 15th, 2015. Stelma, J. (2015, April). Images of Complexity in the Practice of Language Teaching and Learning. Paper presented at the Manchester Roundtable on Complex Systems Theory and ELT, Manchester, UK, April 15th, 2015. Kostoulas, A. (2015, April). Teaching English to Early Primary Pupils in Greece: A Critical View. Contribution to panel discussion titled ‘Teaching English to Young Learners: Some International Perspectives’ at the 49th International IATEFL Convention, Manchester, UK, April 11th-14th, 2015. Stelma, J. (2015, April). Young learners and meaning-making. Contribution to panel discussion titled ‘Teaching English to Young Learners: Some International Perspectives’ at the 49th International IATEFL Convention, Manchester, UK, April 11th-14th, 2015. Hanks, J. and Harvey, L. (2015, April). Collaboration, connection and competition: Early-career researchers making sense of impact. Paper presented at iMean 4, University of Warwick, UK, April 9th-11th, 2015. Impact of Globalisation on Student/Teacher Identities. Paper presented at Liberal Arts International Conference 2015, Texas A&M, Qatar, 1st-3rd February, 2015. Arkhipenka, V. (2014, December). Professional development of English language teachers at master’s level: Why do we need to understand it better? Paper presented at the President’s Doctoral Scholar conference, University of Manchester, 10 December 2014. Holmes, P., Fay, R., Andrews, J. and Attia, M. (2014, November). Competence or purposefulness? How researchers harness their multilingual and intercultural resources when researching multilingually. Paper presented at the 14th IALIC Conference, “Linguistic resources and intercultural (communicative) competence: bridging a theoretical and empirical gap”, hosted by the University of Aveiro, Aveiro, Portugal, November 28th-30th, 2014. Candarli, D. (2014, September). “In addition to this (bunun yani sirs) …”: Formulaic sequences in Turkish Essays. Paper presented at 17th International Conference on Turkish Linguistics, Rouen, France. Fitriyah, S.M. (2014, August). The Introduction and Subsequent Move Away from CLIL in Indonesian Secondary Schools: Some Strategic and Pedagogic Considerations. Paper presented at CLIL conference, Venice, 28-30 August 2014. Kostoulas, A. (2014, July). Tracing dynamics of intentions in Greek ELT. Paper presented at the 10th Annual BAAL Language Learning and Teaching Conference Leeds, 3 – 4 July 2014. Stelma, J. (2014, July). Understanding the complexity of language classroom activity as an intentional system. BAAL Language Learning and Teaching SIG Annual Conference, Leeds, 3 – 4 July 2014. LTE Conference, 25th June 2014. – ‘Bring it back home’ Conference programme and presentations. Ellen Wilkinson, Manchester. Stelma, J. and Lee, W.J. (2014, May). Becoming an intentional language learner – making an intentional world. Paper presented at the Matters of the Mind: Psychology and Language Learning conference, Graz, Austria, 29-31 May 2014). Tantiniranat, S. (2014, May). ASEAN and Thai Policy Documents Analysis: Implications for TESOL Practitioners in Intercultural Age. Paper presented at Kaleidoscope Conference2014, University of Cambridge, 29-30th May 2014.Full paper published at http://corerj.educ.cam.ac.uk/currentissue/. Tantiniranat, S. (2014, May). Mapping the Intercultural (Communicative) Competence Territory: Analyzing Education Policy Documents within ASEAN Economic Community Context. Paper presented at BAAL IC SIG, University of Edinburgh, May 22nd-23 2014. Fitriyah, S.M. (2014, May). Indonesian Language Policy Reversal: Impacts on Teachers’ Motivation to Develop Professionally. Paper presented at Kaleidoscope Conference2014, University of Cambridge, 29-30th May 2014. Halldórsdóttir, T. (2014, May). Walking the Talk: Tensions between Analysis and Advocacy in Ethical Inquiry. Paper Presented at Tenth International Congress of Qualitative Inquiry in Champaign-Urbana in May 2014. Breen, P. & Khan, S. (2014, May). Introducing TPACK in a Widening Participation Context. Paper presented at Paulo Freire and Transformative Education: Changing Lives and Transforming Communities Conference, University of Central Lancashire (UCLan) School of Education & Social Science and The Freire Institute, 28th April – 1st May 2014. Tantiniranat, S. (2014, April). The Challenges and Possibilities of Investigating English Language Teaching from an Intercultural Perspective. Paper presented at CultNet meeting, Durham University, April 25th – 27th 2014. Fitriyah, S.M. (2014, April). Indonesian English-medium Instruction: Policy, Controversy, and Practicalities. Paper presented at IATEFL, Harrogate, 2-5 April, 2014. Dawson, S. (2014, April). The contribution of Exploratory Practice to Professional Development: Research Findings. Paper presented at IATEFL, Harrogate, 2-5 April, 2014. Rostron, M. (2014, February). It’s long, it’s hard, it’s boring: Student Voices on Reading. Paper presented at Qatar TESOL conference, Promoting a Culture of Reading, College of the North Atlantic, Doha, Qatar, 21-22 Feb, 2014. Fitriyah, S.M. (2014, January). Narrative of Indonesian Science and Mathematics teachers’ experiences of Interdisciplinary Curriculum. Paper presented at Interdisciplinary Symposium, Manchester Institute of Education on January 31st, 2014. Tantiniranat, S. (2014, January). The challenges and possibilities of investigating English language teaching from an intercultural perspective. Paper presented at Interdisciplinary Symposium, Manchester Institute of Education on January 31st, 2014. Breen, P. (2013, September) – Teachers in a tide of change: technology’s influence on professional practice. Paper presented at Identity Explored: Language Centre, Language Professional, Language Teacher, Language Learner, 13-15 September 2013, Helsinki, Finland. Rostron, M. (2013, Fall) – Plagiarism and culture. Paper presented at Qatar Faculty Forum, Carnegie-Mellon University in Qatar. Onat-Stelma, Z. (2013, May) – Invited keynote speaker, Teachers Reflect, Teachers Research: Timeless Principles in Changing Times? Presented at Bilgi University ELT Conference, 11 May 2013, Istanbul, Turkey. Breen, P. (May, 2013) – An unending affair – Culture, Language & Identity in Northern Ireland. Paper presented at the Albanian Society of English International Conference on British and American Studies, Canadian Institute of Technology, Tirana, May 3rd 2013. Javier, E. (2013, March) – “Real” Teachers? – Visible ethnic minority native English speaking teachers. Paper presented at TESOL Convention, 20-23 March 2013 in Dallas, Texas, USA. Stelma, J., Onat-Stelma, Z. and Lee, W.J. (2012, September). Ecologies of intentionality in the teaching of English to young learners. BAAL Annual Conference, University of Southampton, September 6–8, 2012. Firth, M., (2012, June) Do students use their agency in university lectures? An analysis of two Quantitative Research Methods to ascertain Human Agency use in Manchester Metropolitan University, Poster presentation at the Agency Conference, June, Cambridge, UK. Halldórsdóttir, T. (2012, May) – So you think you know Scheherazad? Paper presented at Constructing narratives of continuity and change, Canterbury University, 12 May 2012. Javier, E. (2012, May) – You, Me and Us: Researching the racial and linguistic aspects of visible ethnic minority, native speaker teacher identities in TESOL. Paper presented at Constructing narratives of continuity and change, Canterbury University, 12 May 2012. Breen, P. (2012, April) – Attitudes to the role of Communities of Practice in an international education environment. Paper presented at INTO University Partnerships Annual Conference Presentation & Seminar session, The University of Oregon, Corvallis, United States. Rostron, M. (2012, April) – “Are we teaching/are they learning? Academic writing blues”. Paper presented at the Qatar TESOL Conference, 13-14 April 2012, Doha, Qatar. Fay, R. (2012, April). Intercultural perspectives on world music ensemble methodology in the UK: klezmer as a transglobal music with roots in Southeastern Europe. Paper (to be) presented at the Third Symposium of the ICTM Study Group for Music and Dance in Southeastern Europe, April 17th – 22nd, 2012 in Berovo, Macedonia. Halldórsdóttir, T. (2012, April) – Translating the Odalisque: to Bewilder (the) English with Arabic. Paper submitted to Narratives in/of Translation: To Think is to Experiment CNR Postgraduate Research Day, London on 25 April 2012. Stelma, J. (2012, April). Intentionality, convention and fashion in researching multilingually. Researching Multilingually, AHRC seminar, University of the West of England, Bristol, 25 April 2012. Firth, M., (2012) – Are you aware of others? A critical exploration of student identity development for the customer service point. Paper presented at the 9th Circle conference. Harvey, L. (2011, December) – Critical English for Academic Purposes: Creating connection and community. Paper presented at Society for Research into Higher Education (SRHE) Newer Researchers’ Conference, Newport, Wales, 6th-7th December 2011. Firth, M., (2011, November) Poster for HK, A critical examination of soft skills for Global Citizenship in Hospitality, Tourism and Events management education in the UK. In review for the International Journal of Hospitality Management, Elsevier. Poster presentation at the International Research Summit for Hospitality and Tourism, Hong Kong. Conference. Firth, M., (2011, November) HK Presentation: A critical analysis of identity and agency in Hospitality, Tourism and Events Management education in the UK. In review for the International Journal of Hospitality Management, Elsevier. Paper presentation at the International Research Summit for Hospitality and Tourism, Hong Kong. Firth, M., and Baum, T., (2011, November) Generation Z: Soft skill development for Hospitality and Tourism Students from education to industry. Paper presentation at the International Research Summit for Hospitality and Tourism, Hong Kong. Kostoulas, A. (2011, October). From applying Theory to theorising practice: building small-t theories in Greek TESOL. Talk delivered at the Panhellenic [Greek National] Association of State Schools Teachers of English (PEKADE) professional development day “Empowering Language Teaching”. Athens, Greece. This talk has been expanded in an article at the invitation of the editorial board of Aspects Today, the peer-reviewed journal of the Association, and it is expected to appear in late 2011 or early 2012. Firth, M., (2011, September) A critical analysis of the BEIR model of Global Citizenship for vocational students, presented at the Global Vision, Local Action conference, Bournemouth. Conference. Kostoulas, A. (2011, July). “From local pedagogy and global influences towards eclectic practice“. Paper (to be) presented at 7th BAAL Language Learning and Teaching Special Interest Group Conference Theorising practice and practising theory: developing local pedagogies in language teaching (Birmingham, UK, Thursday, 7th and Friday, 8th July 2011). Breen, P. ; Kitching, S. & Wendelkin, P. (2011, June) – A Platform of Good Practice – Developing a Virtual Learning Environment from Content & Support towards a Community Of Practice. Paper presented at INTO University Partnerships Annual Conference Presentation & Seminar session, Exeter University. Kostoulas, A. (2011, June). The emergence of eclectic pedagogy in ELT settings. Paper presented at New Dynamics of Language Learning: Spaces and Places – Intentions and Opportunities, hosted by the University of Jyväskylä. Jyväskylä, Finland. Harvey, L. (2011, June)—– “The social and pragmatic parameters of L2 motivation: EAP teachers’ perceptions“. Paper presented at New Dynamics of Language Learning: Spaces and Places – Intentions and Opportunities (Jyvaskyla, Finland, Monday 6th – Thursday 9th June 2011). Fay, R (2011, June) —- “Possible contributions from Applied Linguistics, Intercultural Education, Narrative Inquiry and Researcher Education“. Paper presented at the Researching effectively medical histories: the international impact of the diagnosis of transsexuality on local gender variant identities, 13th-14th June 2011, hosted by Manchester Metropolitan University. Fay, R. (2011, May) —- “Lyra-dom revisited: Cretan masculinity and other performer sensibilities“. Paper presented at the Musicology Forum at The University of Manchester, 5th May 2011. Fay, R. (2011, May)— Educators as intercultural practitioners – a language teacher education (TESOL) perspective. Seminar / Paper (to be) given at the University Of Thessaly, Volos, Greece, Wednesday May 11th. Javier, E. (2011, May) —– “Researcher Positionality: The Effects of Revealing My Story to Participants in a Narrative Based Study”. ”Paper (to be) presented at The 7th International Congress of Qualitative Inquiry, 18th – 21st May 2011, hosted by The University of Illinois, Urbana-Champagne, Illinois, USA. Rostron, M. (April, 2011) —– “Reading Kafka in Qatar”. Paper presented at Qatar-TESOL conference ”Developing Critical Thinking in the English Classroom”, Doha, Qatar, 8th – 9th April, 2011. Kostoulas, A. (2011). English under the multicultural lens: a critical analysis of the EFL textbooks used in secondary education [In Modern Greek]. In Georgogiannis, P. (ed.) Intercultural education, immigration and Greek as a second or foreign language. Vol. B. (pp. 457-470). Patras, Greece: University of Patras Centre for Research on Intercultural Education. Kostoulas, A. (2011). Developing Multicultural Awareness Through English: Reflections on culture and multiculturalism. In Argyriou, M. and Kambylis, P. (eds.) Arts and Education: Creative Ways into Languages Conference Proceedings, Vol. A, Theoretical and Research Papers (pp. 11-15). Athens: GAPMET and University of Athens. Kostoulas, A. (2011). Said attitudes and unsaid practices in English language teaching. In Panajoti, A. (ed.) The Said and the Unsaid: Papers on Language, Literature and Cultural Studies (pp. 151-159). Vlorë, Albania: University of Vlora “Ismail Qemali”. Kostoulas, A. (2010). ‘Between paradigms: a case study of a language school in Greece.’ In Georgogiannis, P. and Baros, V. (eds.) Proceedings of the 13th International Conference on Intercultural Education, Immigration, Conflict Management and Pedagogy for Democracy. (pp. 401-411). Patras, Greece: University of Patras Centre for Research on Intercultural Education. Onat-Stelma, Z. (2010, May) – Invited speaker, “Teachers as researchers: Taking a road less travelled”. Bilgi University ELT Conference, 15 May 2010, Istanbul, Turkey.